In this sketch I share what the word unstuckable means to me, prompted by my recent appearance on the Unstuckable Podcast. Purpose: To sketch out what the word unstuckable means to me. I recently had the pleasure of being a guest on the Unstuckable Podcast, and during that chat host Stephen Warley asked if I’d be willing to make a sketch of what the word unstuckable means to me. The result is what you see above. It’s good timing for me to be thinking about what the word unstuckable means to me – I just conducted a mid-year review of my self-declared Year Of Conquering Resistance. Because of that theme to this year I’ve be spending lots of time trying to figure out how to stay unstuckable each and every day. 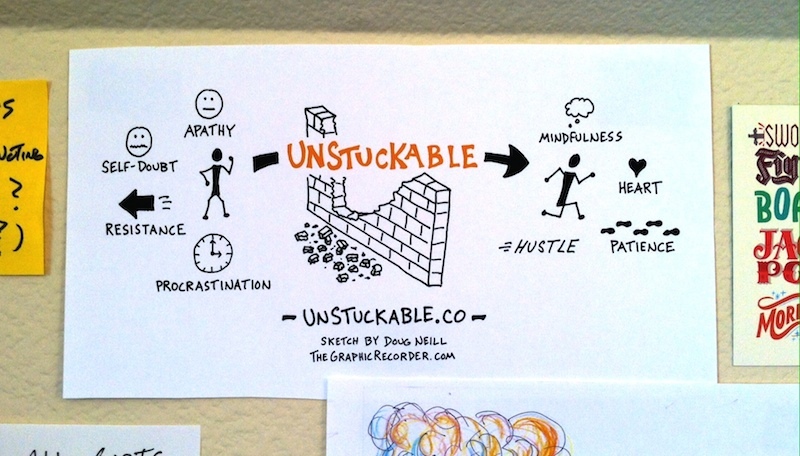 In the sketch above I get at the important characteristics and mindset that can get you from stuck to unstuck. And even though I’ve spent most of this year focusing on routines and deadlines to help me conquer resistance, those traits above are a prerequisite. I’m starting to think of it in this way: mindfulness, heart, hustle, and patience are what you use to break through any wall that’s trying to get you stuck; the structures and routines that you build around your day and your work make that wall thinner and easier to break through. I’ve been so darn focused on routines, structures, and deadlines lately that I think it would do me good to make sure I carry mindfulness, heart, hustle, and patience with me throughout each day. We’ll see if that helps me embody this idea. What do you to stay unstuck?